Q. What are the ways to determine if school is closed or delayed? Q. 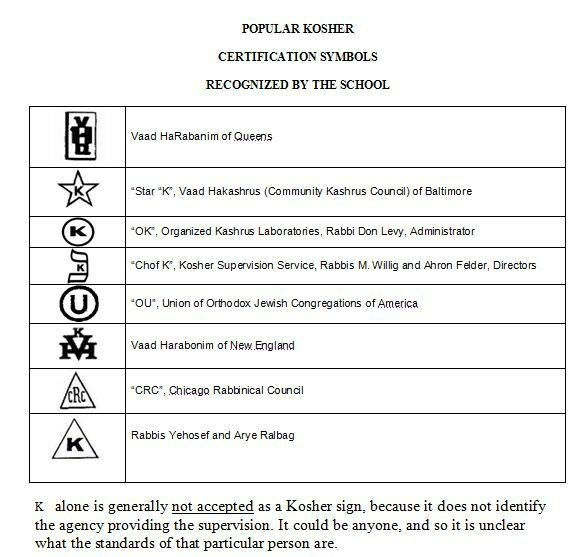 What Kosher Certifications are accepted at SSSQ? Q. Does SSSQ offer after-school extra curricular programs? A. 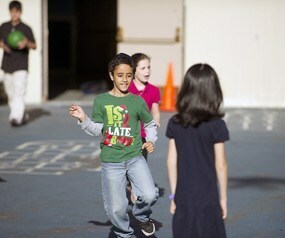 We offer many clubs, including sports, gardening, drama, chess, cooking, music and art. Q. What kind of school trips do students take? A. School trips are age-appropriate and enhance classroom learning. They include everything from museums to show performances. In the middle school, students enjoy overnight trips to Teva-nature camp, Washington, Philadelphia, culminating with an eighth - grade class trip to Israel. Q. What schools do SSSQ students attend upon graduation? Our students attend the finest Jewish and secular high schools, including Solomon Schechter of Long Island, North Shore Hebrew Academy, Abraham Joshua Heschel School, Townsend Harris at Queens College, Stuyvesant, Bronx Science, and Brooklyn Tech. They are admitted to highly competitive academic programs at Cardozo, Forest Hills, Francis Lewis and Bayside high schools and many other prestigious institutions. In addition, our graduates attend the nation’s top universities, including Harvard, Yale, Columbia, Cornell, University of Pennsylvania and others. Some spend a year studying in Israel before starting their college experience. Q. How is your administration structured? A. We have a headmaster, who oversees the entire school; a Judaic studies principal, who focuses on Jewish and Hebrew studies, including curriculum development; and middle school and lower school coordinators, who are well versed in the learning capabilities of children in their respective areas and work closely with teachers to maximize our students’ potential. In addition, the middle school coordinator guides our eighth graders and their parents through the high school application process. Q. What specialty teachers does SSSQ have? A. We have specialty art, music, computer and science lab teachers, learning specialists and a full time bilingual librarian. Q. What other specialists do you have on staff? A. We have a full-time nurse and a guidance counselor. Q. What are your teachers’ credentials? A. All our teachers are college graduates, and most have a master’s degree. All our secular studies teachers are experienced and our Hebrew teachers are native Hebrew speakers with certificates from well-regarded teaching institutions in Israel. We require teachers to participate in our onsite staff development programs, as well as pursue other educational opportunities. Q. What special facilities does SSSQ have? A. We have state-of-the-art science and computer labs, SMART Boards in most classrooms, an updated library and playground with modern and safe equipment. In addition, our school stage has undergone a major makeover; we have two renovated Pre-K rooms, and an updated teacher’s lounge. A. Our security initiatives include-but are not limited to – full-time plainclothes security officers from an elite international security firm and security cameras. We also enjoy a close relationship with the local police precinct. Q. What is the policy for meeting with administrators? A. Our administrators have an open door policy and are readily available to address your questions and concerns whether in person or by phone. Q. What special accommodations do you have for working parents? A. Parents can enroll their children in our extended day program (for a fee), which is available from Monday through Thursday until 6:30 p.m. and on Fridays, one hour past dismissal, which is 4:30 p.m. during daylight savings time and 2:30 p.m. the rest of the year. Snacks and homework help are provided. Q. Is SSSQ’s tuition competitive? A. Our tuition is among the lowest for day school education in the area. We are able to keep our tuition costs low because our school’s endowment provides a built-in subsidy for each child. Q. Does SSSQ offer tuition assistance? A. Parents must apply for assistance, which is granted based on financial need. Our school adheres to kosher dietary laws. Our PTA administers the lunch program with two dairy and two meat days. Q. Is there a school uniform? Q. What does SSSQ’s school calendar look like? A. We observe all Jewish and most major national holidays, including Thanksgiving Day weekend and Memorial Day. Our school vacations coincide with the city public schools’ December recess and summer vacation. Q. How can parents get involved? A. SSSQ offers many opportunities for parents to become involved in their children’s education. Parents can serve as class parents and, through PTA, they can help distribute lunch, volunteer at fundraisers and participate in the holiday, fundraising and programming committees. PTA meetings are conveniently held in the evenings to accommodate working parents. Q. How can I meet other parents? A. SSSQ offers numerous opportunities for parents to socialize with one another, including PTA meetings, the end-of-the-year dinner, annual school gala and golf and special events. Q. What is the Solomon Schechter School of Queens (SSSQ)? Founded in 1956, SSSQ was the first Conservative Jewish day school to take on the Schechter name. It is the only Conservative Jewish day school in Queens. Our approach to worship and ritual is egalitarian. We emphasize tolerance and plurality in the Jewish community, instill loyalty to our country and a commitment to Israel. Q. What grades does Solomon Schechter of Queens encompass? A. SSSQ runs from Pre-K through 8th grade. Q. What is the atmosphere in the classroom? A. With our small classes, we offer a warm, nurturing environment that encourages children to ask questions, probe issues and think creatively and independently. Q. Is bus transportation offered? A. The city provides free yellow school bus service to students in grades K-6 living within a five-mile radius. Q. What do the Pre –K and Kindergarten programs offer? A. In both programs, classes are small in size to ensure each child receives personal attention, with each classroom having one teacher and assistant teacher. Pre-K and Kindergarten classes are also taught by computer, art, music and physical education specialists. In addition, Pre-K and Kindergartens have in-class bathrooms. A. We offer a first-rate secular and Judaic curriculum, including enrichment and remedial instruction. All secular subjects are in line with New York State standards, and we teach about all major secular holidays. Our Hebrew language curriculum employs the well regarded Tal Am and NETA approach to learning Hebrew. In the middle school, we offer Regents classes in Earth Science and Math 1. Q. How does the academic day break down? A. The day is evenly split between secular and Judaic studies.